Trinbago Knight Riders captain Dwayne Bravo, centre, poses with fans wearing his official djbravo47 t-shirts at Fan Club, Chaguanas, yesterday. 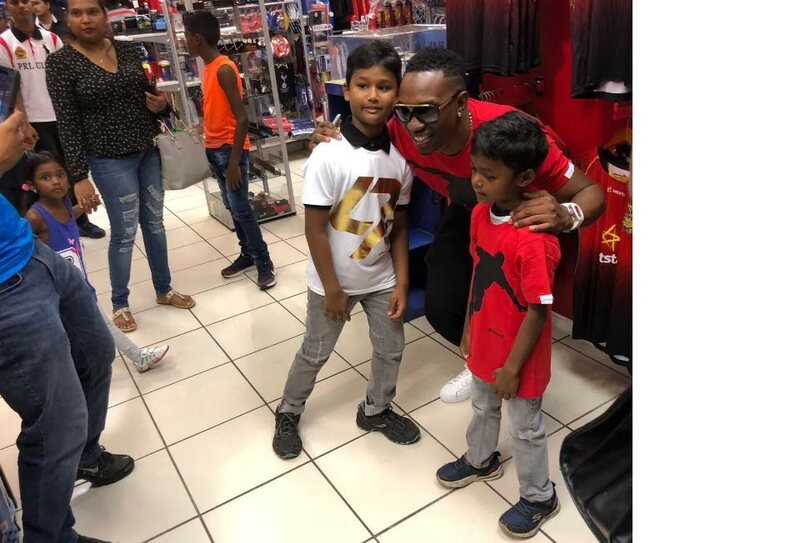 TRINBAGO Knight Riders (TKR) captain Dwayne Bravo yesterday held a meet and greet with his fans at Fan Zone store in Chaguanas. Bravo signed autographs and also showed off his new djbravo47 t-shirts. Children and even adults flocked to check out the merchandise and greet the T20 star who will be in action in the Hero Caribbean Premier League again tonight as he looks to lead TKR to their second straight title. Reply to "Bravo greets fans, unveils signature t-shirts"